So, as you know, we’re impressed with The Draft – tell our readers more, for example what you’re most proud of as a company and what sets you apart from others. 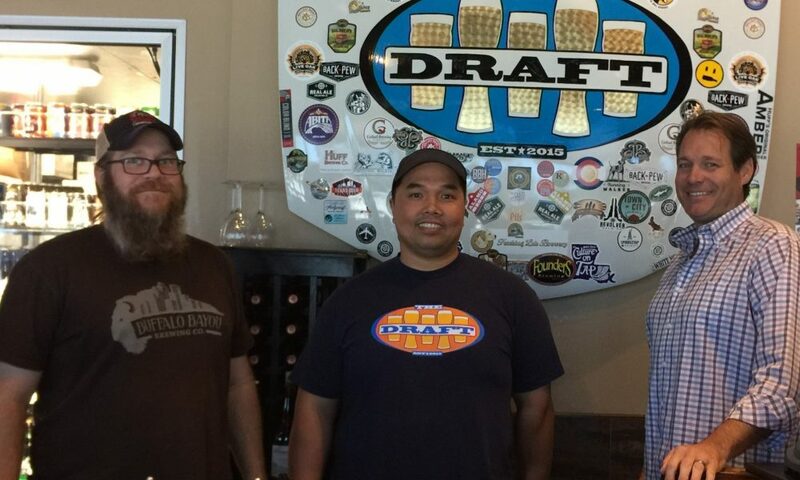 The Draft is a sports bar that caters to those that enjoy craft beers. We also offer a full selection of liquors and several wines. In addition to hand crafted cocktails and an ever-changing variety of beers, we have a menu to satisfy your appetite! Our food is not your typical bar food. Customers love our extra crispy chicken wings, half pound burgers, flat breads, fresh salads, and crawfish (seasonally). However, what you may not expect is our authentic Vietnamese Banh Mi pork sandwich with sriracha seasoned fries, house made meatloaf, Korean BBQ ribs, Frito pie topped with smoked pulled pork, fresh cook to order Chicharones, Louisiana style boudin balls, and hand breaded mozzarella sticks. People tend to come for the beer but they come back for the food! We are known for our family friendly, sociable, and clean atmosphere. Some are entertained by the Golden Tee and darts in our game room. Others come out when we host UFC fight nights. We show almost any sport you want to watch on our 32-big screen TV’s. Our biggest crowds come when our beloved Houston teams are playing. As a company, we are proud of our fun, friendly, and helpful staff. Each one of our servers and bar tenders have their regulars that come back to visit because of the experience they had with us. We take pride in the quality of our food and the knowledge of our bar tenders to create call as well as specialty drinks that suit the needs of each patron. Our loyalty to local breweries as well as craft options from across the country keep those beer enthusiasts more than satisfied. Therefore, what sets us apart is our variety and the offering of a high-quality experience. The best thing about our city, Houston, is the convenience of what our city has to offer. With record population increases, we also have businesses opening on a daily basis. This gives us variety in shopping, eating, drinking, and entertainment. The worst thing about our great city is the congestion. Because of the number of people in and around Houston, what would normally take about 25 minutes travel time, may take you up to 45 minutes or an hour. The good part about the bad, is that you can get to any part of Houston in about an hour.